철종 12년(1861)에 지은 집이다. 안채를 비롯하여 사랑채·행랑채·광채·곳간채가 있다. 안채를 제외한 이들 건물들은 1930년대에 다시 지은 것이어서 안채에 비하여는 격조가 떨어진다. 집의 앞쪽에 '一'자형의 행랑채와 사랑채가 있고 안쪽에 'ㄱ'자형의 안채가 자리한다. 광채와 곳간채는 안채의 양 옆으로 각각 위치하고 있다. 행랑채는 왼쪽부터 측간·외양간·행랑방으로 배열되었고 오른쪽 끝에 대문이 있다. 사랑채는 행랑채의 오른쪽에 있는데 행랑채의 댓돌이 낮은데 비하여 사랑채의 죽담이 훨씬 높아서 사랑채가 우람하게 보인다. 사랑채 오른쪽은 언덕으로 연결되며 앞은 넓은 바깥마당이다. 바깥마당은 담장 없이 외부로 개방되어 있다. 큰사랑방·대청·건넌방이 배열되었으며 바깥마당쪽으로 툇마루를 놓았다. 행랑채의 대문을 들어서면 안채와 사랑채를 경계하기 위한 담장이 축조되어 있고 그 사이에 작은 쪽대문을 설치하였다. 안채는 쪽대문을 통하여 출입할 수 있다. 이렇게 바깥마당과 가운데마당·안마당으로 구분을 지은 공간의 구성과 전개는 이 집의 가장 큰 특징이다. 중앙에 있는 대청이 중심이 되는 안채는 활달한 구조를 하고 있다. 기둥 사이가 아주 넓은 반면 기둥 높이는 낮아 차분한 안정감을 주는 건물이다. 대청의 왼쪽으로 안방이 있고 안방 아래쪽으로 넓은 크기의 부엌이 있다. 골방과 건넌방은 대청의 오른쪽에 자리한다. 대청은 마당쪽으로 개방이 되어 있고 안방 앞의 툇마루를 통하면 부엌으로 동선이 연결된다. 사랑채 동쪽의 3∼400년이 되는 회나무, 안마당 한쪽 화단에 심어진 모과나무·향나무 등은 전통적 민가의 정원기법에 따라 꾸며 예스러운 느낌이 들게 한다. 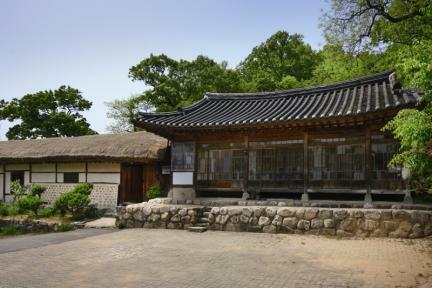 This house was constructed in 1861, the 12th year of King Cheoljong’s reign. 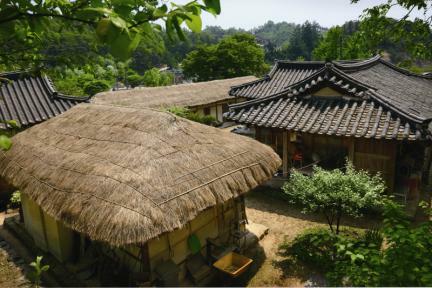 It consists of the anchae (women’s quarters), sarangchae (men’s quarters), haengnangchae (servants’ quarters), gwangchae (storage building), and gotganchae (barn). These buildings were built in the 1930s except the anchae, so they look less intricate compared to the anchae. The haengnangchae and sarangchae are located before the anchae. The gwangchae and gotganchae are on both sides of the anchae. 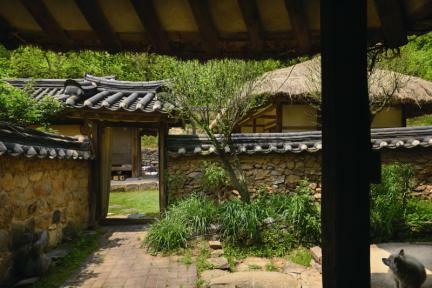 The haengnangchae consists of a toilet, a cow shed, and the servants' rooms arranged from the left, with the main gate on the right end. The sarangchae is on the right of the haengnangchae; it looks rather imposing due to its high foundation compared to that of the haengnangchae. 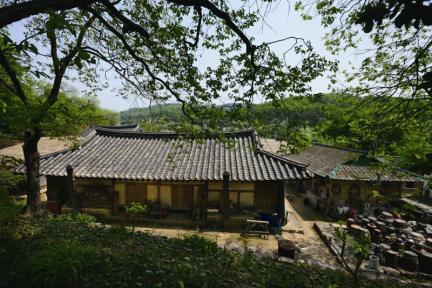 The right side of the sarangchae is connected to a hill, and the front side has a spacious courtyard.The outer courtyard does not have a fence, so it is open to the outside. The sarangchae consists of the elder’s room (main room), the daecheong (main wooden floor), and a room across from the sarangbang. It has a toenmaru (wood-floored veranda) on the side of the outer courtyard. When one walks in through the gate, one sees a fence and a little gate between the anchae and sarangchae. One should use the gate to enter the anchae. The structure of sectioning off the outer, middle, and inner courtyards is the most unique feature of the house. 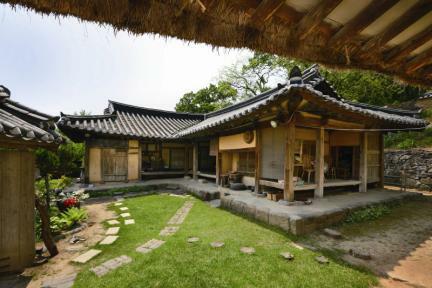 The anchae has an active structure since it has the daecheong at the center and provides a tranquil, stable feel due to its wide, low pillars. The anbang (main room) is located to the left of the daecheong, with a wide kitchen connected downward to the anbang. A small back room and a room across from the anbang are on the right side of the daecheong, which is open toward the courtyard. One can get to the kitchen via the front toenmanu (small side wooden veranda) of the anbang. A 300~400-year-old spindle tree on the right of the sarangchae as well as several quince trees and junipers planted on the flower garden of the courtyard show the traditional landscape technique used for private homes. ※ Viewing of the cultural property above is usually available anytime but may be limited depending on the owner’s personal circumstances.